If the TV reception were better, I would award the hotel 4 1/2 *s.
Significantly better quality than the nearby Hilto Post Oak and Hotel Derek. Slightly fuzzy TV screen both on my TV and the one across the hall. Liked the hotel overall, but positioning us next to the ice room where people get ice probably isn't a good idea. Very clean updated, and good concierge. Put us too close to the ice maker in the next room. 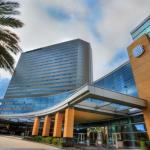 InterContinental Houston, steps from Galleria, is a blend of Texas hospitality and modern style. Historic Hermann Park, the Theatre District, the Museum District, Texas Medical Center, Reliant Center, George R. Brown Convention Center and Houston Livestock Show and Rodeo are minutes away from the property, twenty-six miles from George Bush Intercontinental Airport. A gift shop, newsstand, ice machine, ATM, whirlpool and outdoor swimming pool are a big plus. InterContinental also provides business conveniences like printer, PC, facsimile, Internet and copier. There is 50,000 square feet of versatile meeting space for social and business events. Guests can take advantage of courtesy area shuttle within a three-mile radius of the hotel. Both smoking and non-smoking accommodations are available. For in-room entertainment, the hotel provides cable / satellite televisions, CD players, DVD players, pay-per-view movies, cable channels, stereo sound system and video games. For the convenience of the guests, the hotel offers self and valet parking. Picho serves Spanish- and French- influenced fare for breakfast, lunch and dinner. Bar 2222 sells tapas, classic cocktails, world class wines, vodka and popular Stoli-Doli martini. You can meet friends and business partners in the Lobby Lounge. Aerobic equipment, including stairclimbers, treadmills and life cycles are installed in the onsite health and fitness center.